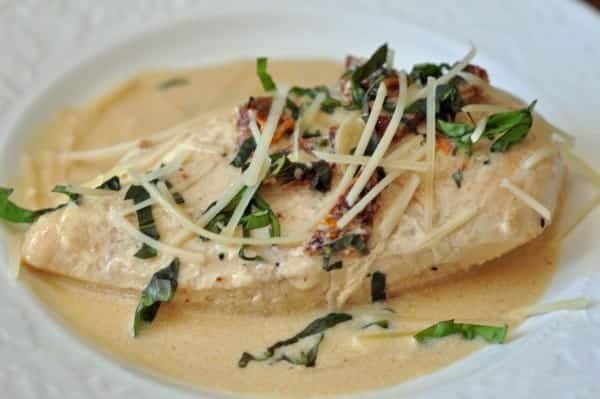 This is a delightful chicken dish with plenty of a basil herb sauce that goes well with pasta. You can cook like a gourmet chef at home, we will share a recipe that can’t go wrong. Boneless skinless chicken breasts never tasted so good. Be sure to make up pasta or rice with this dish you will want to savor the sauce. Chicken breasts are braised in a creamy white wine sauce with Sun-dried tomatoes. Sprinkle chicken with salt and pepper. Heat oil in a heavy medium skillet over medium-high heat. Add chicken to skillet and sauté until golden, about 4 minutes preside. Add garlic and stir for 30 seconds. Add wine, cream, and tomatoes, and bring to a boil. Reduce heat to medium-low, cover skillet, and simmer until chicken is just cooked through about 3 minutes. Transfer chicken to plates. Add basil to sauce in skillet. Increase heat and boil until sauce thickens enough to coat spoon, about 2 minutes. Season sauce to taste with salt and pepper; spoon over chicken and serve. I made the sauce and it was really runny (not like the picture). Any advice? The sauce is amazing. I added mushrooms and green peas, it turned out very good. I served over bowtie noodles, cut the chicken and served on top! Can’t wait to make again. Thanks Stephanie! I just tried this and it was soooo delicious I actually ate both servings. I had it with some basmati rice, but I made extra sauce and soaked it up with some bread – delicious! I will definitely make this again. Thanks Stephanie. I really love that recipe, it is easy, and tastes so good! Hello, can you copy the recipe for craker barrel’s slow baked chicken recipe with stuffing that they usually served during a monday lunch special? I also like the recipe for their roast beef recipe or pot roast maybe. And the last one is the recipe for their Fried chicken that they served during Sundays. Thank you for your requests I will definitely keep them in mind!